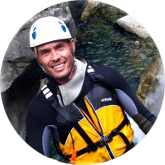 “I’m Demis Centi e and I’m a mountain guide registered to the Trentino Mountain Guide Association”. Canyoning, climbing courses, via ferrata, trekking and family activities are offered by my small agency, which has as its objective the customer care and satisfaction. Contact me and I will recommend the most suitable activities to enrich your days surrounded by mountains and lakes with new and fun adventures in the company of a professional UIAGM mountain guide. My name is Demis and I am a mountain guide. At the age of nine I was wearing a climbing helmet. Hanging off ropes like a salame, breathless on the spire of Castel Corno, pulled up by a strong climber who was also a family friend. From then on I approached the world of mountains on tip toe and with ever increasingly tight climbing shoes. At nearly eighteen I took my passion and audacity around the world. Ice axes, crampons; a bit of training on eucalyptus trees and off I went, without having ever seen an ice fall, onto the Diamond couloir on Mount Kenya. A few months later, my enthusiasm more than my technique took me to the extreme north, onto the faces of Baffin island. Climbing shoes, ropes, skis and ice axes, always with me. No undertaking, no folly, but only great adventures. Trekking in South Africa, Nepal, Pakistan, India, South America stole my heart. Countries where I returned a number of times to climb, like in the Indian Himalayas, or the plains of Madagascar. A breath of thin air takes me back to South America, from Alpamayo, Artensorajo, Ojos del Salado, Aconcagua, and other less known peaks. But my best adventure at that latitude remains the Hielo Continental Sur. What is there to say about Indonesia, Borneo, Solewesi, Sumatra; where among crags, vulcanoes and forests I tried to live with very little, enjoying the depths of the sea. Fate had sealed my future: when I grow up I shall be a Mountain Guide.